This post is a continuation of an earlier post: Unity Shaders – Depth and Normal Textures (Part 1). The post after this is Part 3, which covers using both depth and normal textures. Now that we’ve learned how to just get the depth texture, and display its values as a grayscale image, let’s do something interesting with it. I’m going to do a simpler version of the ring of light that passes through the environment in the Quantum Conundrum dimension shift effect. Instead of starting the ring from the center of wherever I’m looking at, I’m just going to have it start from the farthest point I can see, and travel linearly past the camera. Additionally, as the ring passes through objects, they will be left with a slight color tint. Since this is an animated effect, it will require a time variable. Fortunately, Unity provides a built-in value we can use: float4 _Time : Time (t/20, t, t*2, t*3). If this looks confusing, let me explain. The property name is _Time, and its type is a float4, meaning a vector with 4 float components. The x component is “t/20″, meaning it gives the value of time divided by 20, the y component is “t”, so normal time, the z component is time multiplied by 2, and the w component is time multiplied by 3. In this case, we want to use time to give us a value that’s going to go from 0 to 1. In the following code, _RingPassTimeLength is the length of time we would like the ring to take to traverse the scene. _StartingTime (which we will set in a .cs script) is the time when the ring first begins to move, and _Time.y is the the time at the moment. When the ring first starts to move, the starting time is the current time, so _Time.y – _StartingTime = 0, so t = 1. Then, as _Time.y increases, the value of t will decrease. So if we use the variable t to adjust which depth values we are looking at, we can traverse the scene. What we need to do is declare these properties, and then define the uniforms using the same names. float _RunRingPass = 0; //use this as a boolean value, to trigger the ring pass. It is called from the script attached to the camera. //basically taking the original colors and adding a slight red tint to it. And below is the script to be attached to the camera. Let’s call it DepthRingPass.cs. 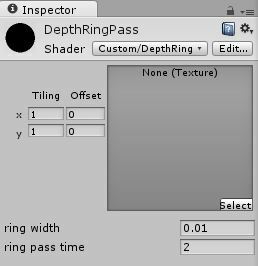 In addition to passing the depth texture, as well as an image of the rendered scene from the camera to the shader, the DepthRingPass.cs is also triggering the ring to start. Whenever the user presses the “E” button on the keyboard, it sets the uniform variable _StartingTime to the current time and sets _RunRingPass to 1 (which then sets the shader to draw the ring). The reason why I’m using SetFloat here is because there isn’t a SetBool function (at least not that I’m aware of). Remember, you’ll need to attach the shader we wrote to a material, and then set the material as our mat variable in the above script DepthRingPass.cs, which is then attached to your camera object. We will end here for now. In Part 3, I will talk about using both depth and normals in your shader, specifically, how to work with DepthTextureMode.DepthNormals. This entry was posted in Code, Development, Video Game and tagged depth buffer, depth texture, gamedev, shaders, Unity, Unity3D, vertex and fragment shaders by William Chyr. Bookmark the permalink. Hello william and thanks for sharing your knowledge, that’s cool ! if (depthValue < t & & depthValue > t – _RingWidth). It throws me an error (“undeclared identifier ‘lt” line 54). Could you give me some more information about it ? @Vincent: There seems to be a problem how the characters are presented through html5 or so. Strange thing is, the tutorial code is looking wrong to me, your answer right, i can’t find a “lt” there. Solution: If it happens, that you have a ” & lt ; ” without the spaces, this has to be replaced by a “less than” sign, ” & gt ;” means “greater than” and “& amp ;” is just the “and” sign.